An exemplary example of Queen Anne style Victorian architecture, the Ingomar Club was originally the home of William Carson. 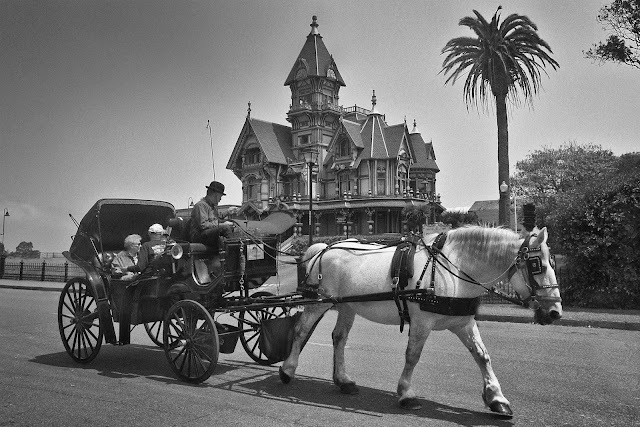 Designed and built by brothers, Samuel and Joseph Cather Newsom [contracted by Mr. Carson], the home was completed in 1883. The house is located in old town Eureka, California. The word Luddite has become synonymous with technophobia. It is my assertion that this moniker has become a misnomer and has very little to do with fear of the new, but rather everything to do with a concern of loss; loss of craftsmanship, loss of tradition, loss of passion and the loss of humanity. I embrace technology and its evolution, but am cautious of its encroachment over simplicity and the reliance on it to produce what could otherwise be produced in better fashion by the artistry and experience of a luddite. With this blog, I hope to uphold the memory of Ned Ludd and his devotees. • Please respect the copyright. • Unless otherwise noted, all photos, artwork, text, video and recordings on this blog are the property of Keith S. Chambers. • If you want to use any materials or images on this website, please ask first by leaving comments on the posting in question. • If you are interested in artist signed prints of any works on this website, please make inquires by leaving comments on the posting in question. I don't have a master-plan for this blog. I'm just going to post what I feel like posting. Unless otherwise noted all comments, photography, video, music and artwork — general content — posted within this blog are my own. Photography being my main medium, I'm currently using a Lumix G3 [digital camera] micro 4/3 system as my carrying around camera. I use a variety of lenses on this camera, that for the most-part, I don't feel it necessary to point out what lens was used for what photograph; but just so you know, I use manual 'legacy glass' in addition to my Lumix lenses. Periodically, I still shoot film with a small collection of rangefinders, slr cameras, box cameras and plastic point-n-shoots. If I post photos from these cameras, I'll point out those shots just to let you know that the world hasn't gone completely digital. After all, this is a luddite's journal. All photography on this blog © kc, unless otherwise noted.